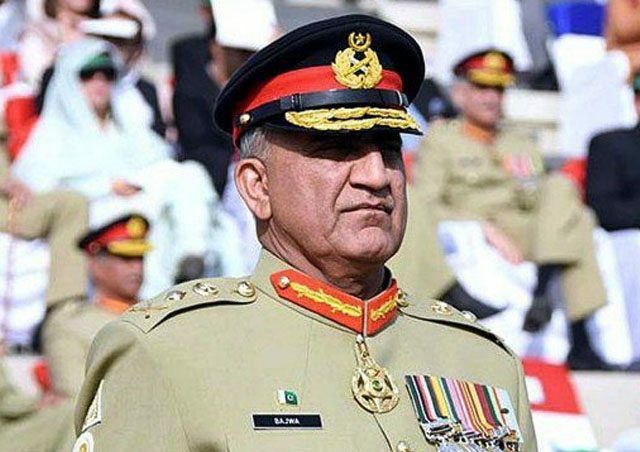 ISLAMABAD: Chief of Army Staff (COAS) General Qamar Javed Bajwa remarked that Pakistan can be kept safe and strong if Quaid-e-Azam Mohammad Ali Jinnah’s vision of human values, social justice, equality and fraternity, is followed. Director General (DG) ISPR Major General Asif Ghafoor, in a tweet, shared the COAS’s message on the birth anniversary of the father of the nation. The 142nd birth anniversary of Father of the Nation, Quaid-e-Azam Mohammad Ali Jinnah is being celebrated across the country with traditional zeal and enthusiasm on Monday. The day, a public holiday, dawned with a 21-gun salute in the provincial capitals, with the national flag hoisted at principal government buildings. A change of guards ceremony took place at Mazar-e-Quaid in Karachi earlier today. The cadets of Pakistan Military Academy (PMA) Kakul assumed the ceremonial guard duties at the mausoleum. The Commandant of PMA Kakul, Major General Akhtar Nawaz, was the chief guest at the ceremony. He also laid a floral wreath and offered fateha at Jinnah’s mausoleum. The governor and chief minister of Sindh will also visit the Mazar-e-Quaid, and lay floral wreaths and offer fateha. Scores of organisations have arranged programmes to pay respects to Jinnah and highlight various aspects of his life, vision and leadership. Prime Minister Shahid Khaqan Abbasi has stressed upon making collective efforts to achieve the objectives of a stronger and developed Pakistan as set by the Father of the Nation, Quaid-e-Azam Mohammad Ali Jinnah. In his a message on Jinnah’s 142nd birth anniversary, the prime minister said this day has a special significance for the whole nation because besides paying tributes to the great leader, it was a day to reiterate the resolve for reviving Quaid’s thoughts and move forward with his ideas. The premier said under Quaid’s thoughts, an impartial and just analysis of the last seventy years’ history would be helpful in determining the future course.